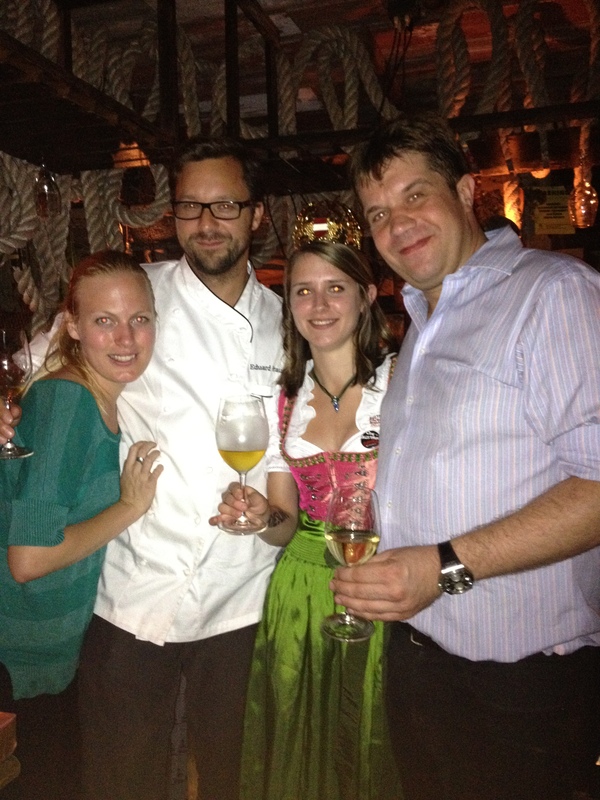 Austria has long been a wineproducing country of Riesling and to that end it is among those countries considered to be above others in their flavors and character, but it wasn’t until this past summer that we joined Paul Grieco and the Summer of Riesling team on their never-ending quest to promote all things Riesling. 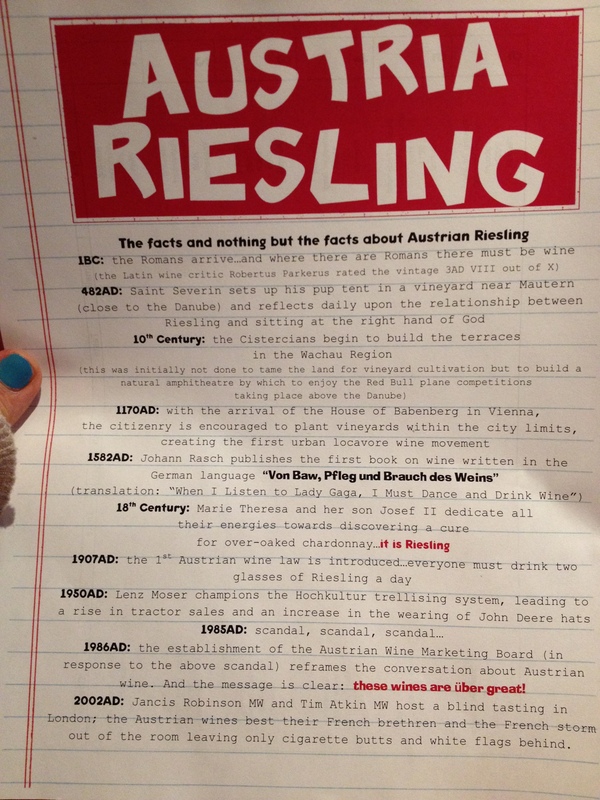 By now you know a bit about the Summer of Riesling, of course. After five years it has developed from a dedication of Paul’s white wines by-the-glass list to an international festival. This year we not only officially combined forces, but we took Chicago, New York, and so many other places by storm. Looking back, it was an intense summer! When others were resting and relaxing by the pool, we were busy swirling, sniffing, and sipping in the name of Riesling. So what was it we did anyway? Where to begin…. It really began in Chicago in April at our Austria Uncorked tasting where we started to spread the word… and it quickly spread to Vienna, Austria at the biannual VieVinum festival at which the Summer of Riesling team stood dutifully for three days in the grand Höfburg tattooing everyone from Master Sommeliers to the President of Austria and so many others! 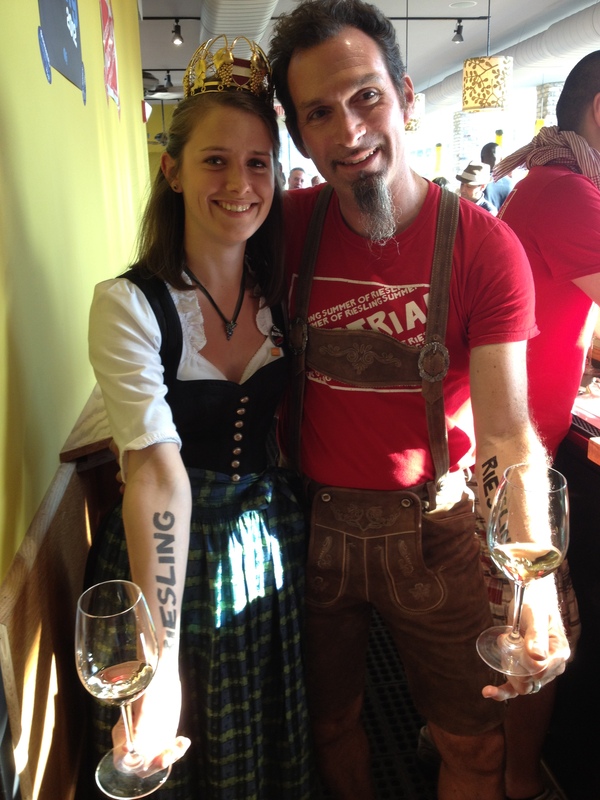 But if you want to get technical, the beginning was the first day of summer and a late-night kick-off party where we offered top industry folk tastes of Austrian Riesling in conjunction with the Summer of Riesling – you should have seen Paul in his lederhosen that night! Quickly we moved to #WineChat Riesling – a virtual tasting we organized to demonstrate to wine bloggers, writers, trade, and anyone else interested in joining in on the fun that not all Riesling is created equal, and to that end most of it isn’t sweet! Wines of Germany USA and Wines of Alsace joined us and we were able to provide participants with a representative bottle from each region – it was one educational whirlwind! July we took a step back as Germany took the spotlight, but that didn’t stop us from talking us a storm about Austrian Riesling on Twitter, Facebook, and to anyone who would listen. We even joined them on their boat cruise – you should have seen the tattoos! August hit and it was now our time. In preparation for our Ode to Austria festival in Chicago we flew Queen Elisabeth Hirshbüchler over from the Weinviertel region to Austria to the shores of NYC for the first time. While here she and Paul Grieco led a late-night wine and cheese tasting in conjunction with Murray’s Cheese Shop, a dirndl walk down the Highline as part of the Dirndl Temptation, and made appearances at several Terroir Wine Bars. Once we returned from Chicago (the second time, read below) she continued her reign tasting people on Riesling, making appearances at parties, and making sure the late-night farewell party at Edi & the Wolf went off without a hitch! It was Chicago, however, where we really took the spotlight! The first Ode to Austria celebration took over Chicago featuring a flurry of wine dinners Friday night, Austrian brunch at the Publican all weekend long, in-store tastings, an all-you-can-drink/all-you-can-dance Riesling inspired dance party, an industry soiree at the newly opened Chicago City Winery, and finally a Sound of Music singalong at the famed Julius Meinl Cafe featuring bites of Austrian deliciousness and copious amounts of Riesling! Paul even wrote us our very own Ode to Austria – one we will forever treasure! Whew! As they say, though, it’s not over til it’s over and we weren’t quite done yet! 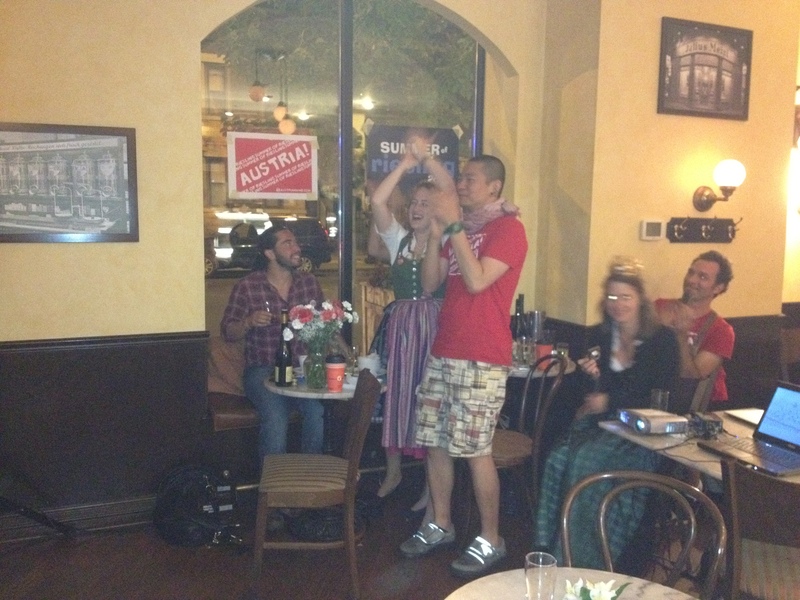 We already mentioned our late-night party featuring over 32 different Austrian Rieslings and a boatload of fun, but despite it being our farewell to the Ode to Austria and, sadly, Queen Elisabeth, we kept going for another month! The culmination of it all sadly came a week ago on the last night of summer. Lucky for us, Paul wasn’t quite done either so all night long, Hearth Restaurant did us the pleasure of featuring Austrian wine by-the-glass and Riesling flights for just $10. 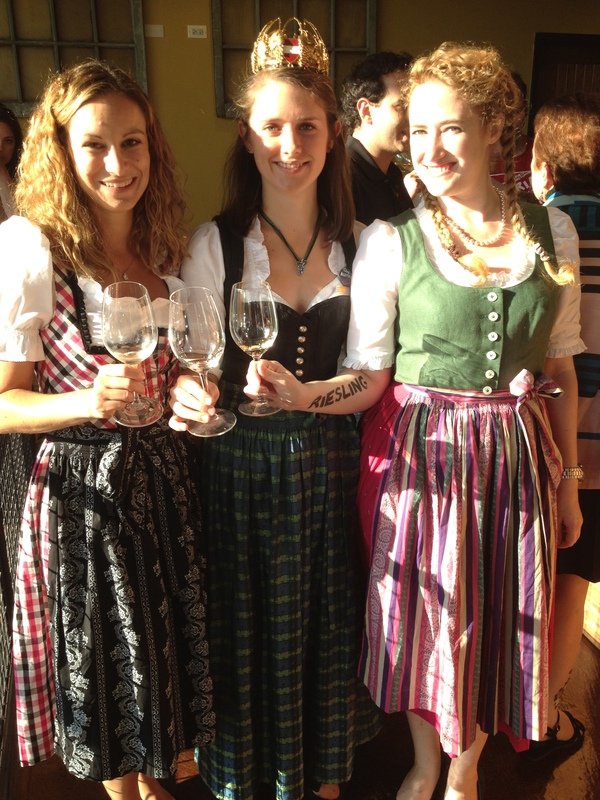 Simultaneously, a farewell dinner offered diners a taste of Austrian Riesling alongside some super delicious cuisine too! In case you were wondering, yes, we miss it already. The good news is that we have a new focus and a new whirlwind to live through now: The Reds! ← Hans Tschida from Angerhof Tschida in Illmitz is “Sweet Winemaker of the Year“ at the 2012 International Wine Challenge (IWC) in London.